our Water Heater at this point. It's surprising how two bolts breaking can totally screw up your day. Our electric water heater died. Specifically the element that does the actual heating failed and needed replacing. The job is a relatively simple task. 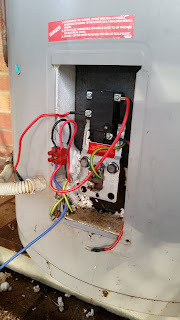 .Undo the four bolts holding in the old element, disconnect and remove, put in the new element, reconnect and you're good to go. Shouldn't take more than 30 minutes at most. That's how I thought the day might go. Not for me personally but for the electrician our landlord hired to do the job. 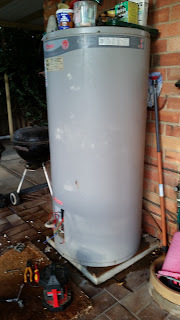 Unfortunately, we're dealing with a 17 year old water heater that hasn't had any maintenance work in at least the two and a half years that I've lived in this house. Two of the four bolts broke off in the process of removing the old element. If you've ever had this happen to you, you'll know removing broken bolts that are rusted in can be tricky at the best of times. Especially if you don't have the option to weld a new, make shift bolt head onto the remaining part of the bolt. It may have been possible to fix the new element back in place with just two bolts had the snapped bolts been on opposite corners but since it was both the bottom bolts that snapped there wasn't enough force to maintain a seal around the element and stop the heater from leaking. The Electrician, who had already come back from another job he attended whilst waiting for the WD-40 to take effect on the remaining three unsnapped bolts (the second one snapped at this point) proceeded to try everything he could to fix the leaking element plate. Presumably because the alternative appeared to be replacing the heater entirely. In a Herculean effort of drilling, trying various bolts, two or three trips to the hardware store (I presume), much swearing, a cut open hand, and with failing light he finally called it quits. At that point it looked kind of like he may have stopped the leak with a dubious center bottom bolt that he installed but I was pretty sure, once the water started heating up, it would leak again... and it did. I kind of feel for the electrician. He didn't want to let those two broken bolts beat him. All he had to do was get the seal to not leak by some alternative method. How hard could it be...right? Turns out, very hard. He probably should've given up after the first hour and resigned to the fact that a new water heater was the way to go. It was an option, as he'd already had the discussion with my landlord before he did anything. I've since looked up on Youtube how to remove broken bolts and I'm not sure any of the techniques would've worked here. Maybe? Hard to tell with rusted in bolts. I'm sure the electrician probably tried at least a couple of methods - I don't know as I preferred to keep out of his way whilst he worked. I don't really have the tools to try myself. Anyhow, he's supposed to head back today to see the results of his handiwork. I presume we'll end up with a new water heater. Would have been much better all round if those two bolts hadn't broken.